Feeling uninspired by the stretches of blank space throughout your apartment? We’ve got the solution. Simply hang a group of frames together to create a collage of art or photos for your own gallery wall. While gallery walls have gained popularity again in the last few years, they’re really a classic staple of design that won’t go out of style any time soon. Been dreaming of hanging one of your own? 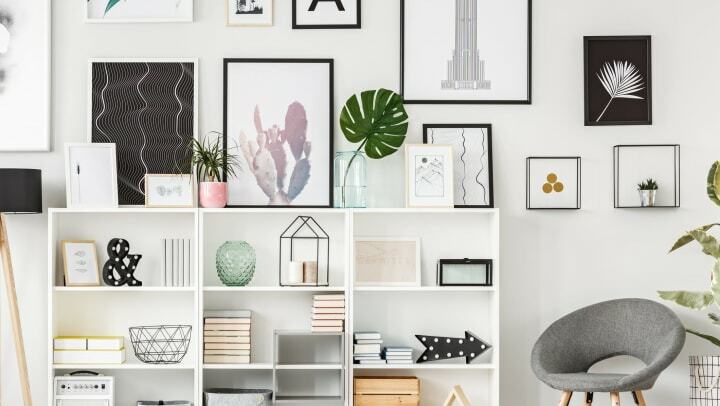 We have your step-by-step guide on how to hang a rent-friendly gallery wall in your apartment at Alta Citizen, no hammers or nails necessary! Decide on the vibe you want your space to have and think about how you can reflect that in your gallery wall. Maybe you want to stick to choosing frames in just a couple colors to match the rest of your decor, or you want to include a mix of tones and textures for a more eclectic look. Pick the photos or prints you want to include and place them in your frames. Whether you’re shopping for new pieces or using ones you already have, gather them all together on the floor or a big tabletop. This will allow you to try arranging them a few different ways before hanging up everything. Want to see how your idea will look up on the wall? Lay down old newspapers or paper grocery bags to trace your frames, and cut out the shapes. Use masking tape to make the arrangement you have in mind up on the wall and see your vision come to life. Once you have your idea planned out on the wall, use a level to mark a line lightly in pencil just above the paper shapes taped up there. Here’s a life hack: A lot of smartphones have a level tool, or you can download an app for one. You can even make marks around the corners of the paper shapes if you really want to make hanging your frames even easier. It’s time to hang up your gallery! Picture-hanging strips like the ones from Command Brand are a great choice for putting up your gallery sans nails. They won’t leave holes in your walls, plus your pictures will stay exactly as you placed them, no crooked frames here! Simply take down the papers you taped up, attach the no-damage strips to your frames, and place them inside the pencil marks you drew. For more home tips and ideas for adventuring around Alta Citizen, check out our blog.